Barely any more expensive than the outgoing Canon MP640, the MG6150 crams in an extra grey cartridge for fabulous fidelity and an elegant touch panel interface. It's a cracker. Extra grey cartridge for beautiful black-and-white photo prints that are free of colour casts. A4 printers have a lot to contend with. Some ask them to produce crisp documents with rich black text, whereas others want gorgeous photo quality output. Many of us want both, which is where Canon's latest PIXMA ChromaLife100+ printers have made a name for themselves. Models such as the MG5150 include pigment- and dye-based black inks, plus yellow, cyan and magenta dye-based inks, which team up to produce rock solid document output and stunning photo prints. The MG6150 goes further still, with an additional dye-based grey ink cartridge making it great for top-quality black-and-white photo printing as well. Ideal for the photo enthusiast who also wants to print documents, the MG6150 has a lot to offer. An ultra-high-resolution 9,600dpi print engine based on near-microscopic 1pl (picolitre) ink droplets is hooked up to a 4,800dpi, full 48-bit colour scanner, enabling you to print, scan and photocopy. You also get three memory card slots, which include direct compatibility with CF, MS, MS Pro, MS Duo, MS Pro Duo, SDHC and MMC cards. There's also optional compatibility with various other cards, including xD Picture Cards via additional adaptors, and you can print directly from attached USB flash memory sticks. Stand-alone printing and photocopying is greatly refined when compared to older printers such as the Canon MP640, thanks to a crystal-clear 3-inch LCD and immaculate touch panel. The latter features underlying icons that only illuminate when active. Epson performed a similar trick when upgrading its PX710W to the PX720WD, and it really makes the interface much more intuitive to use. 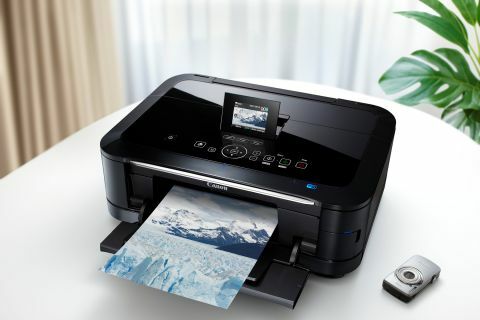 Printing from a PC or laptop is equally painless, thanks to Canon's typically logical printer software as well as full USB, Wi-Fi and Ethernet connectivity, enabling you to print from all round the home. As with most Canon printers, the dual full-sized A4 input feeds include an underlying cassette, which is ideal for plain paper, and a rear tray, which is perfect for photo paper. In our tests, print speeds were identical to the five-ink Canon iP4850, at six seconds for a mono text page, 16 seconds for colour DTP, 19 seconds for a 6 x 4-inch photo print in standard quality mode and exactly 2 minutes for a full borderless A4 photo print at the highest quality setting – all very impressive. One drawback with the cheaper iP4850 and more modest all-in-one printers in the vein of the MP640 and newer MG5150 is that black-and-white photo prints can take on a slight colour cast. There's no such problem with the MG6150, since it includes an additional grey cartridge that provides excellent monochrome fidelity. Another bonus is that you can also print directly onto white-faced CDs, DVDs or Blu-ray discs, unlike all-in-ones such as the HP Photosmart Premium and Lexmark Interact S605.